Are you looking to enjoy a scenic outdoor view at the comfort of your own home? We specialize in installing patios alongside our landscape design services. An outdoor patio can create the perfect space to enjoy hosting guests for outdoor gatherings like parties and cook outs. We use durable patio products made from quality pavers. The quality of our materials allow you to spend more time enjoying your new patio and your landscape view instead of caring for it. In addition to patios, we also install high-quality lighting fixtures to make your home more visible in the evening. We offer a 15+-year warranty on our lighting fixtures along with a limited warranty on all of our patio installations. Add the perfect enhancement to your home. Your new patio awaits. 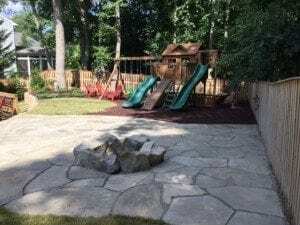 Goshen Enterprises provides expert patio installation services for customers in Laytonsville, Gaithersburg, Rockville, Germantown, Derwood, Montgomery Village, Olney, and Damascus.